You may have already noticed, that we at Ballantyne Chiropractic Wellness are always thinking what is best for our clients. One thing we really are passionate about, is helping our clients to help themselves. That means not that we just keep learning new things all the time, nor even that we treat our clients the best possible way when they enter our office, we also want to educate them and give all of you the chance to learn new ways of keeping your health in mind every day. So, we decided to organize weekly Stretching Workshops to help you to take care of you! This is me TRYING to abduct my toes. Each Workshop lasts approximately 45 minutes and is free to our clients ($5 for others). We always begin with awakening of feet and spine by doing 15 minutes gentle movement to warm up and continue to learn good stretching techniques variably either on lower or upper part of the body. We'll set the goal for every session in the beginning of workshop, so please bring your specific issues to the discussion! Our main goal will be restoring the good and healthy posture both in standing (walking) up and in seated position. This is the reason, why we always do work with flexibility of spine (from sacrum bone up to neck). Stretching Workshop is open for everybody and mainly lead by Kata, but in some cases or special issues we will be getting some instructions from Dr. Snipes. Please bring your own water (or you may purchase some) and wear comfortable clothing. 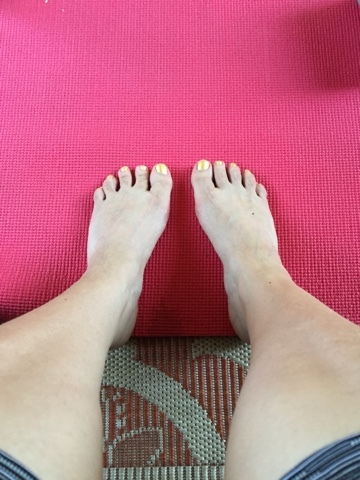 You don't need your own yoga mat nor shoes; we prefer opening the muscles on souls of the feet and moving barefooted (unless you have plantar fasciitis or other tendinitis with pain).